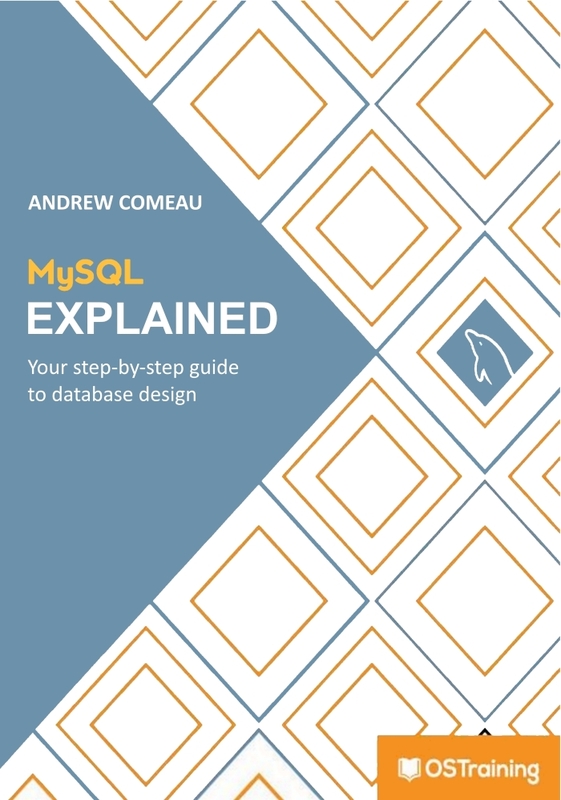 My newest book, MySQL Explained, is due to be published this month! You can check out the LeanPub page to show your support and to sign up for notifications of when it’s published. See the description of the book below. UPDATE 10/24/2015 – MySQL Explained is now available in both EPUB and MOBI (Kindle) formats with the first chapter available for FREE from LeanPub.com and Amazon.com! Read more about this guide to the leading database for online applications and on the official page! MySQL Explained is a step-by-step tutorial for everyone who’s ready to learn about the database software most commonly used for storing information behind some of today’s most popular websites and online applications. Written especially for people outside the I.T. world, MySQL Explained provides the background information you need to get familiar with database theory and the principles behind organizing data. This book starts from the ground up, helping the reader to understand the very definition of a database, the forms it can take and the different options for storing information. By the end of this book, you’ll understand the reasons for choosing MySQL, the options for installing it and the tools that it offers to store and safeguard your data. If you are in any way involved in designing or managing a website or data solution of any kind, you owe it to yourself to understand the tools involved. Quality database management sytems are essential in today’s data-driven world and such essential tools should not be a mystery to those who depend on them. MySQL Explained can help you unravel the mystery and learn more about a technology that will be around for a long time to come. MySQL Explained is published through OS Training which, in addition to publishing tutorials like this one, offers onsite and online training in web technologies including Joomla, Drupal and WordPress. This entry was posted in Database Design and tagged database, mysql on October 11, 2015 by Andrew Comeau.